Lake Winfield Scott - Lake Winfield Scott Recreation Area is a destination recreation location situated high in a mountain valley. The recreation area offers year-round recreation opportunities including camping, picnicking, boating, fishing, swimming and hiking centered around the beautiful 18-acre lake. The campground is divided into a north loop and a south loop. Note: The lake levels are currently low while maintenance is being conducted on Lake Winfield Scott. Lake Nottely – The 4,180-acre TVA-controlled Lake Nottely is a fisherman’s paradise, offering ample opportunities to land largemouth bass, spotted bass, crappie and striped bass, among others. 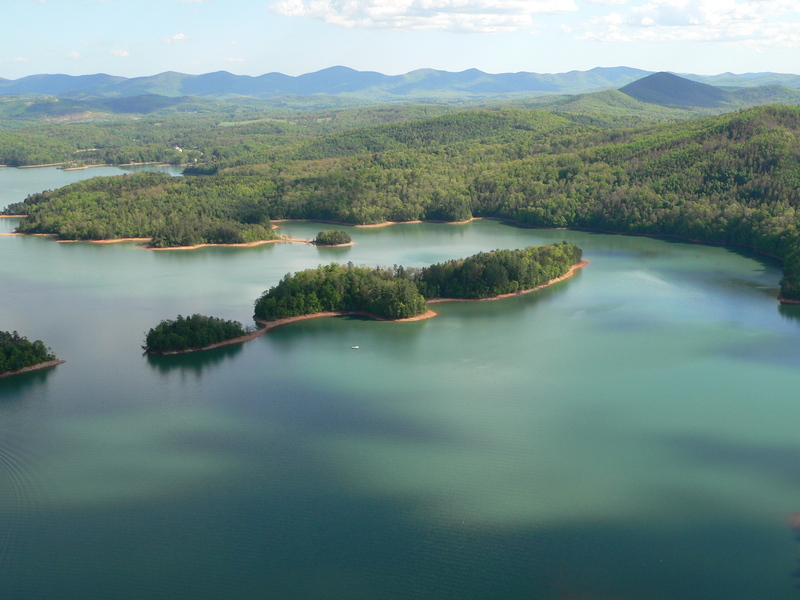 With 106 miles of pristine shoreline nestled in the mountains just northwest of Blairsville, this unspoiled lake offers a breathtaking alpine experience for residents and visitors. Construction of the dam was completed in 1942. It is 184 feet high and stretches 2,300 feet across the Nottely River. Lake Trahlyta – Lake Trahlyta offers a view of the esthetic beauty of the mountains and is situated next to Trahlyta Falls, a stunning north Georgia waterfall. Visitors can enjoy a swimming beach, fishing, and pedal boats on the water in addition to mini golf, interpretive programs, music programs, hiking, fishing, bird watching, CCC museum, cottages, and camping on site at Vogel State Park. Nottely Marina - The Nottely Marina has a general store with a fuel dock, live bait & tackle, boating supplies, clean restroom facilities, a safe boat launch, pontoon rentals, covered and uncovered slip rentals. Located at 86 Doucette Circle, Blairsville. You can reach them by phone at (706) 745-3638. Nottely Boat Club & Marina – Gas & boat slips available. Located at 6036 State Hwy 325. You can reach them by phone at (706) 897-9499. North Georgia Watersports - Providing all of your rental, sales, and service needs. Pontoon, wakeboard, ski boats, Jet Skis, Waverunner, kayaks, and jetovator rentals. Located at 2132 Murphy Hwy, Blairsville. You can reach them by phone at (706) 835-1222. Click on the map below for directions to one of our area lakes.